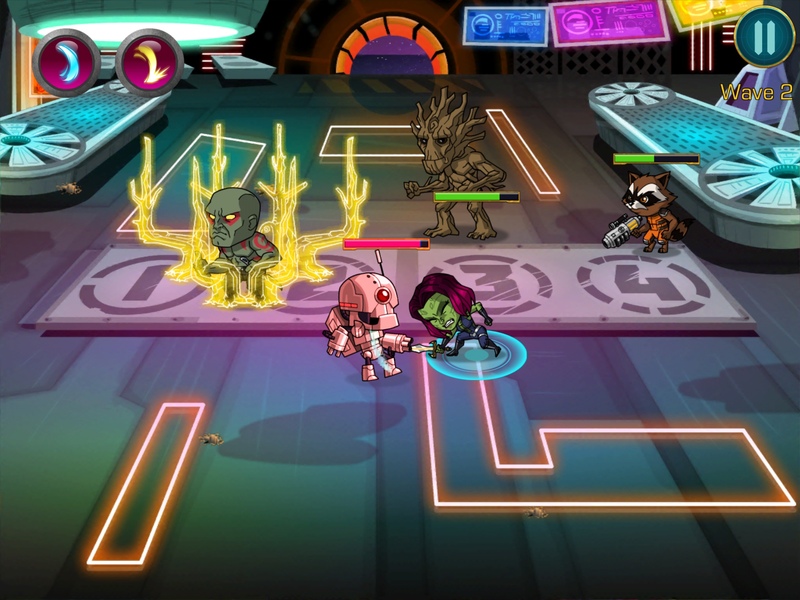 GOTG: The Universal Weapon makes use of party-based, real time combat. If that sounds familiar to you, then you've probably played the original Battleheart before. Basically, you control a party of four (4) characters to fight off galactic baddies. You start out with just one character, Peter Quill or Starlord and slowly unlock other characters as you progress (there are a total of 25). Your 'guide' is the Russian space dog Kosmo who basically acts as your guide throughout the game. There are a number of worlds to travel to, starting with Prison 42 – which you need to break out of and Xandar which is about five or so worlds away from your starting point. The purpose is slowly revealed to you in the form of comic strips explaining the rest of the story. There's Arena mode, too (see above). Again, it's a Battleheart inspired idea where you can earn XP, coins and stuff for your inventory depending on how many waves you survive and how many baddies you take down. 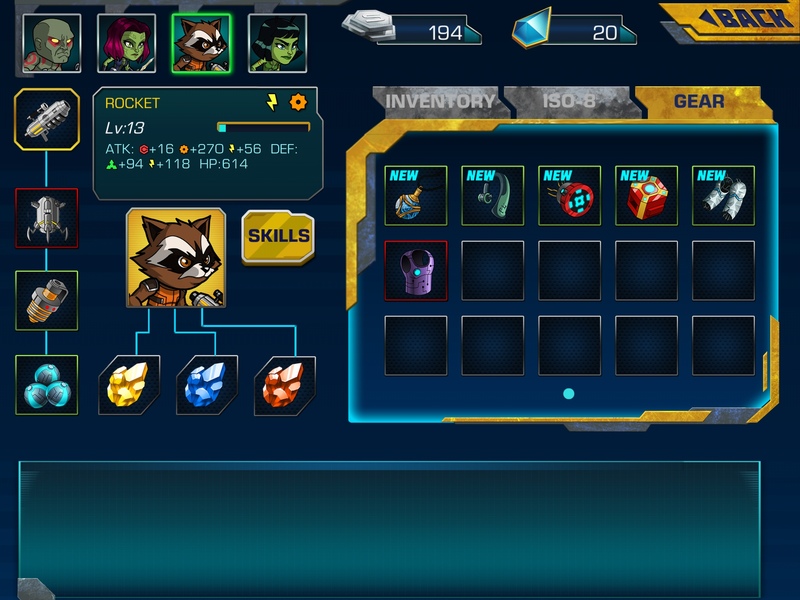 There are some quests available, such as say, use Groot's Rocket combo attack 30 times. I haven't finished a quest yet so I don't know what the reward is. Ah, the add ons. Power boosts, buffs and the like are in the form of accessories and ISO-8 crystals, which you buy by earning silver after beating a level. As you can see, there are limited slots for your stuff, so you have to choose carefully. ISO-8 crystals of the same color can be fused together to form a stronger crystal which is supposedly stronger than individual shards. Gameplay wise, it's hard to distinguish one from the other in terms of actual benefits or boosts, despite the plethora of statistics you'll find per character. Unlike Battleheart where you can earn stuff that will increase critical strike chance or drain enemy health, the stuff available is pretty basic and just consist of buffs to improve your attack, health and defense. 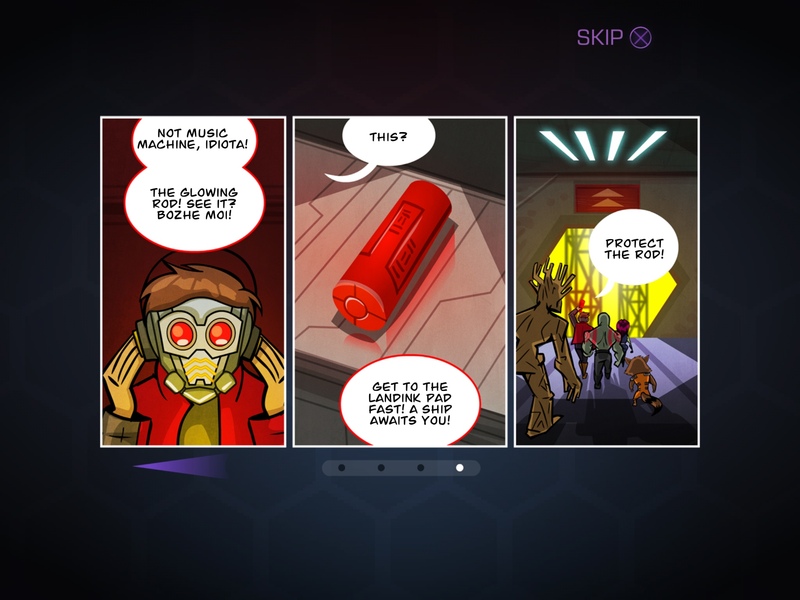 Surprisingly, despite the 'appearance' of GOTG: The Universal Weapon as a game where in app purchases or IAPs would be perfect for, say, using real money to buy ISO-chips or silver coins, there's none of that here. What you need, you earn through hard work and putting in time at the Arena or replaying missions. Basically, the GOTG: The Universal Weapon is a one time kind of deal – you buy once, you get the whole package. Considering that this game is a tie in to a blockbuster hit, the lack of IAP was a breath of fresh air to someone who is allergic to them. Per character, you also have a skill tree where you have to choose between some skills and abilities according to your needs – again, this will be familiar to anyone who's played Battleheart. A new concept introduced is the idea of combo attacks where your character paired with another character can do damage to two enemies at once. 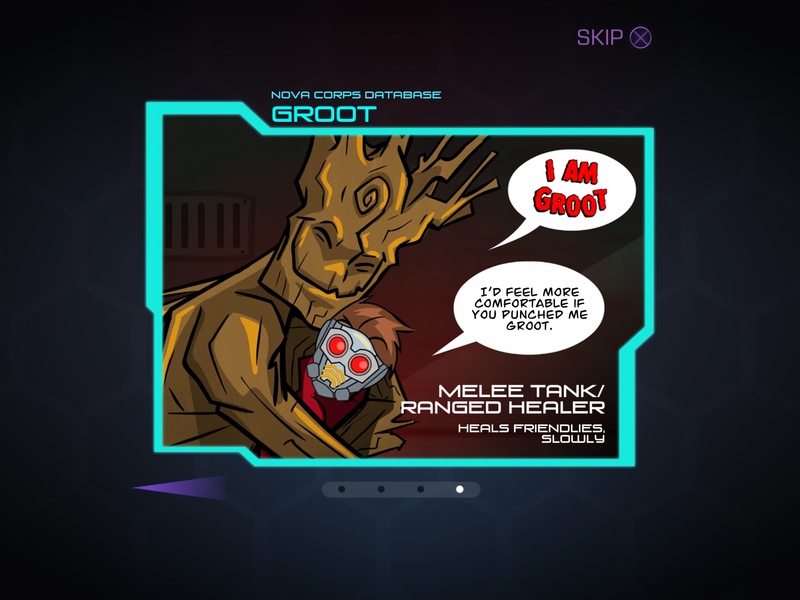 Pairs like Groot and Rocket, do significant damage together, which is pretty fun to watch. Gameplay is quite short – too short, in fact, to be truly challenging during the early stages of the game. 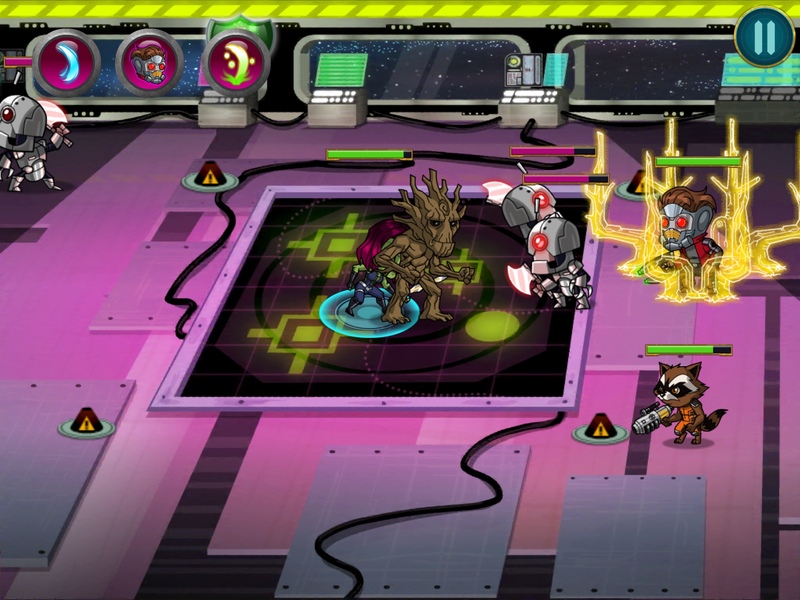 As the game progresses, there are environmental hazards that reduce your characters' health such as electric poles, spaceships that appear out of nowhere just to do damage, etc. These put a neat twist to the gameplay since you need to avoid these hotspots as much as you can. Bad guys, however, are pretty generic, except for the occasional appearance of 'boss' type or important characters that you can later recruit to join you in the Arena. The pace of the game is rather plodding and things only start to pick up when you move to the second location. By then, you will need to invest some of your silver in better equipment. 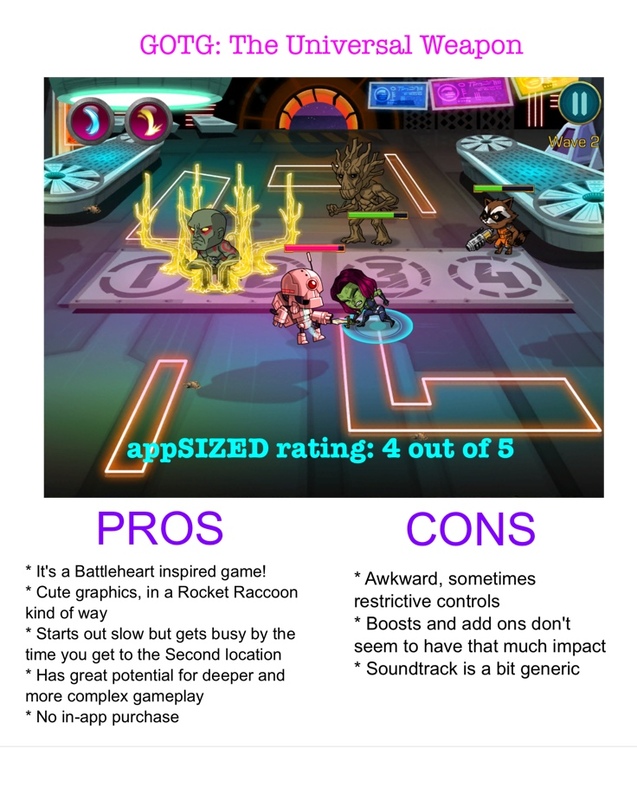 As for playable characters, the beauty and challenge of Battleheart is trying to find an ideal balance of attack, defense, health and ranged players. In GOTG: The Universal Weapon the distinctions between the characters in terms of abilities and special attributes is rather vague and not terribly challenging. Then again, I have yet to unlock the entire roster of characters in the game, so maybe it's too early to tell. GOTG: The Universal Weapon relies on line drawing for you to control and manage all the members of your party. Unfortunately, controls-wise, the line drawing element is not as fluid as it should be. The characters need additional help in terms of manueverability, which often spells the difference between victory and defeat. If you beat the level though, you are rewarded to a happy dance by the surviving members of the party, and after beating a certain number of levels, Hooked on a Feeling will gleefully play in the background. These quibbles aside, there are many things to like about this game. 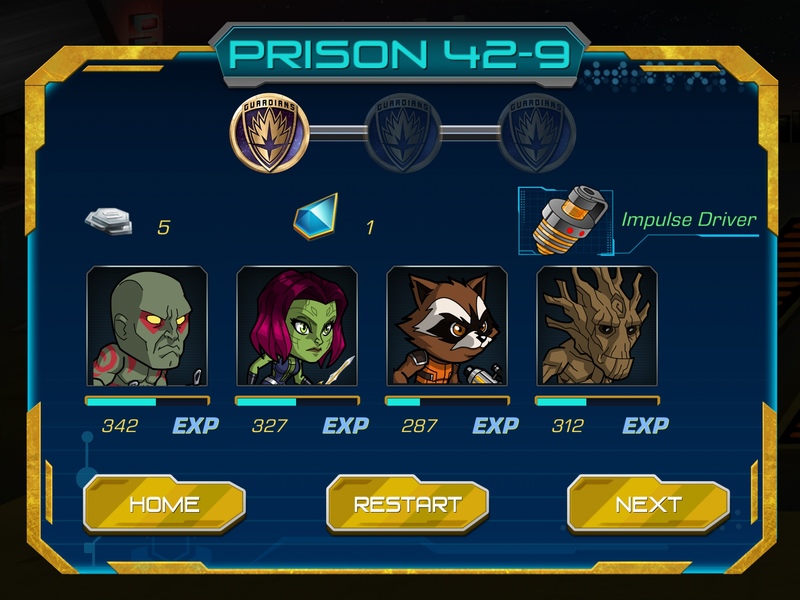 One is the fact that while it is a movie tie in, it doesn't feel like one – you won't feel outdated when you play GOTG: The Universal Weapon long after the movie's run. Another is, I'm happy and relieved that this game is not your usual movie tie in kind of game, and tries to do something different instead of the usual action, shoot em up movie tie in game. With the developers promising new content for free and regular updates, I believe in the game's potential to be something even better. GOTG: The Universal Weapon is not lacking in terms of humor. It's not an original concept and it's not as well executed as its muse, Battleheart, but it's great to see a movie tie in game that tries to break out of the mold. Seriously, an iPhone game with no in-app purchases? I never thought I’d see the day. yes! pretty amazing, and for a marvel tie in, too!